The previous record for the largest alligator ever legally hunted in Alabama was, until this week, held by 14-foot, 2-inch, 838-pound specimen caught in 2011. But now that honor goes to an even larger critter. The monster brought in by the Stokes and Jenkins families was easily measured at 15 feet long. 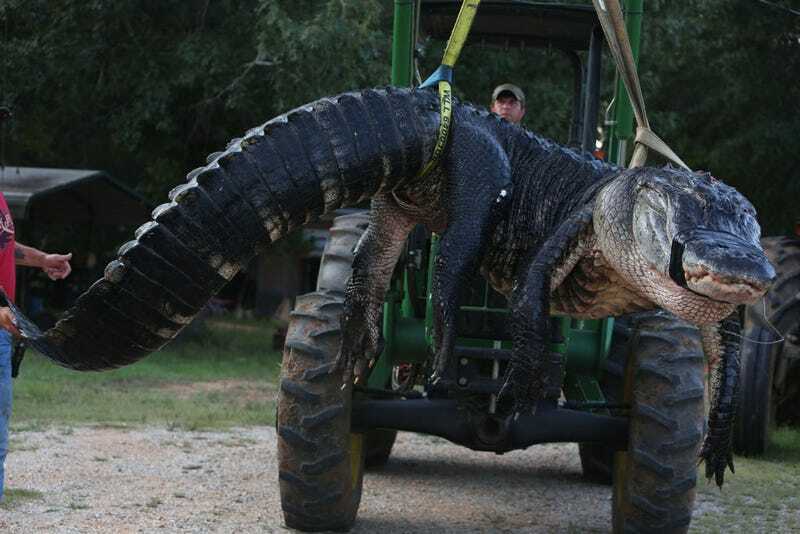 But the first attempt at weighing it "completely destroyed the winch assembly used to easily hoist most average gators," according to AL.com. Thanks to the assistance of a park backhoe, state biologists announced the new record at 1011.5 pounds. "Alligators are still protected by law," according to the state's wildlife services website, but "Alabama has instituted a program for limited hunting in an effort to control populations and increase the animal's wariness to humans." Let's get something clear: we're sharing these photos not to glorify the hunting of monster animals for sport, but instead to marvel at the sheer size of this beautiful creature. Just look at those claws!